Enterprise Ireland is the Government agency responsible for the development and growth of Irish enterprises in world markets. We work in partnership with Irish enterprises to help them start, grow, innovate and win export sales in global markets. In this way, we support sustainable economic growth, regional development and secure employment. 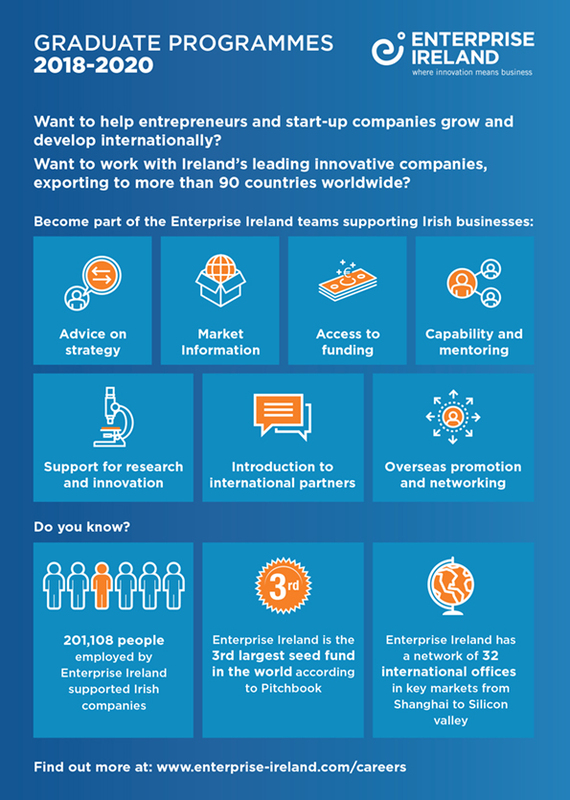 Enterprise Ireland works with Irish enterprises across the full business development spectrum, from early-stage entrepreneurs to established companies and Irish multinational companies, supporting them to grow their business, which is fundamental to creating and maintaining jobs in Ireland. This two year, Ireland-based Graduate Programme offers graduates an opportunity to support Enterprise Ireland’s work with Irish enterprises as part of a professional and dynamic team, contributing to our companies’ successes and therefore supporting sustainable economic growth. As Development Executives undertaking a range of roles throughout the organisation, graduates play a key role in helping Enterprise Ireland to deliver on our vision for Irish enterprise to become a powerhouse of economic growth and job creation. This two-year International Graduate Programme offers graduates the opportunity to start their career in one of Enterprise Ireland’s network of locations across Europe, the Americas, the Middle East and Asia Pacific and to gain experience supporting Irish enterprises as part of a professional and dynamic team. As Market Executives, our graduates contribute to the success of our client companies by supporting them to access market opportunities, win global sales and build and develop their business in global markets. These graduates also play a key role in helping to create market awareness and building Ireland’s positive image as an international source of world-class products and services. Are these opportunities for you? These challenging roles require confident individuals who are professional, client-focused, and highly motivated with the energy and enthusiasm to deliver projects and results. Excellent communications, network and relationship building skills, coupled with a teamwork-oriented and flexible approach are essential. Fluency in a second language is an advantage. Placement on Enterprise Ireland’s Graduate Programme 2019-2021 will be subject to verification of meeting the eligibility criteria. Assessments may include online questionnaires/testing, video or telephone interview, assessment centres and interview/presentation participation. 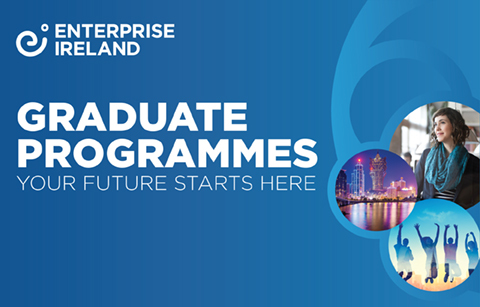 Successful graduates joining Enterprise Ireland on the Graduate Programme 2019-2021 will begin their programme in Dublin in late August/early September 2019. Applying for all the different graduate programmes can be overwhelming, especially when exams and project deadlines are soon approaching.